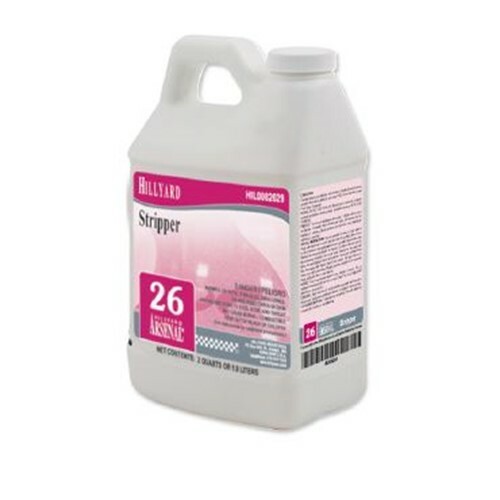 Hillyard Arsenal Stripper 26, HIL0082629, will remove any water based polish quickly and easily. Arsenal Stripper will remove polish coats that have been repeatedly burnished and hardened with ultra high speed floor machines. The superior performance of Stripper will easily cut throught multiple layers of any competitive floor polish as well. With Stripper you get immediate results. This saves not only time but also money by reducing labor costs. Simply mop on, allow it to dissolve the polish buildup for 3 to 5 minutes, then agitate the dissolved finishes lightly with a mop, and finally wet vacuum away or scrub with a floor machine. A single half gallon container of Stripper dilutes into a five gallon pail of cold water. No more glugging and guessing how much stripper to put in. Dilution control that anyone can measure. No more lifting and transporting five gallon pails of stripper from one end of the building to the other. Stripper is conveniently packaged only in half gallon containers to be poured directly into a five gallon pail.